How the rent-to-own retail model, exemplified by Rent-a-Center, evolved from a mainstream model in the U.K. to one widely seen as predatory in the U.S.
Today's GIF comes from a 1989 Rent-a-Center commercial. Love to read? Start reading with superpowers. Readwise is a tool for Kindle and iBooks that helps you grow wiser and retain more of what you've read. Sign up for free to effortlessly sync your data and start receiving a daily email of your favorite passages from your favorite books. The size of the rent-to-own industry in the United States, according to the Association of Progressive Rental Organizations. The model came to life in the country starting in the 1970s, with the idea that “renting” goods, rather than buying them on credit or paying in full with cash, opens up opportunities for more people to have access to such goods. (In other words: No credit check.) Such goods are now sold by 9,200 retailers in North America, according to the group’s industry overview. Rent-a-Center alone represents more than 2,400 stores. For a lot of Americans, we think about appliance rentals in terms of (specifically) the chain Rent-a-Center, a company that has gained a reputation of offering appliances and furniture to people at a weekly or monthly cost—but one that, if you break it down, is an asking price well above its market rate. But the key word here is “Americans.” See, this model didn’t actually start in the U.S. Its roots are actually in the United Kingdom, particularly around the 1930s. 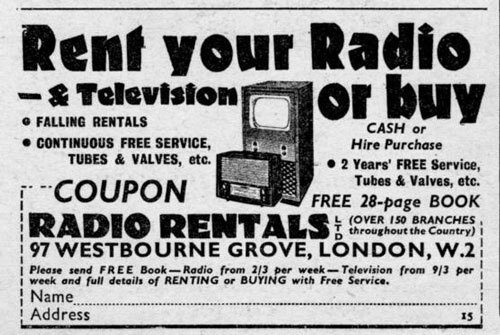 The first firm of its kind, called Radio Rentals, came to life in 1930, the work of Percy Perring-Toms, a Brighton, England-based radio dealer who saw that it might be appealing to consumers to rent radio sets rather than purchasing them outright. The company grew quickly—by 1936, the firm had gone public and had tens of thousands of customers. One secret to its success was a vertical business model—not only did Radio Rentals rent out the radios, but during World War II it eventually owned one of the country’s main radio manufacturers. But beyond that, it also benefited from the high cost of radio ownership at the time. Buying a radio was expensive; renting a radio, while still expensive, was much more manageable. And in an era before credit cards had taken over, it was an attractive model for a wide audience of people. But it was another invention still making its way out into the world that would make this model truly reach its full potential. On January 26, 1926, John Logie Baird successfully demonstrated his version of the television set, a medium that would come to dominate 20th century culture in a way perhaps only comparable to the car. Lots of people would eventually want one, and after World War II ended and television broadcasts went back on the air in the UK, Radio Rentals became a popular way to get one. 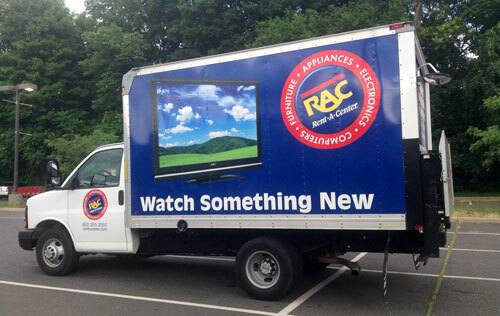 The brand name for many of the TVs they eventually sold? Baird. The British believe that rented television has notable advantages, even for those who could well afford to buy. Rental companies carry a wide variety of sets (one firm offers a choice of 32 new models at rentals ranging from $4.20 to $8.40 a month and 17 used models at even lower rates) The monthly rent that a "subscriber" pays is reduced every six months for the first few years that he continues to keep a set, and discounts are given for advance payment. Best of all, subscribers have no difficulty getting faulty sets repaired or replaced at no charge. The larger rental companies maintain mobile repair vans with parts, test benches and generators; one firm handles 30,000 service calls a week. How popular was TV rental in the UK at the time? Per the Time article, 80 percent of British television sets were rented at the time, compared to less than 1 percent of American sets. And those U.S. sets were mostly rented by hotels. Eventually, the company (which merged with the consumer electronics giant Thorn Electrical Industries in 1968) expanded its reach beyond even televisions, to all kinds of consumer electronics. CD players? Camcorders? They had it at this High Street chain. To give you an idea of how mainstream the company was at one time: As Max Headroom was trying to sell the public on New Coke in the U.S. in the late 1980s, he was trying to sell the British public on Radio Rentals. The company eventually faded from view at the turn of the 21st century, just as computers, the internet and flat-screen televisions were threatening to change its business model for good. The company still lives on in Australia and New Zealand, but it’s arguable that its torch is truly carried on by U.S. companies that put their own twist on the rental concept. Like Rent-a-Center. The company was founded in Wichita, Kansas. The firm, founded by onetime Wichita State student Tom Devlin in 1973, came about as a result of Devlin’s experiences working in an appliance store and finding that many consumers would get their payment plans rejected. 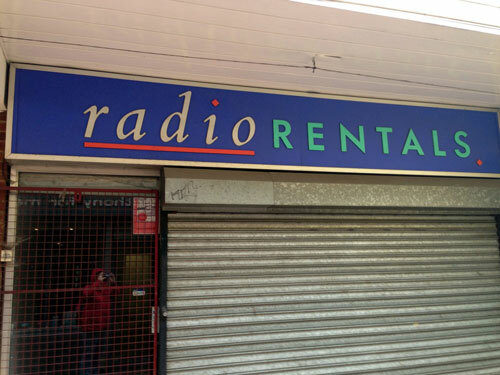 Radio Rentals’ parent company at one point owned Rent-a-Center. Thorn EMI purchased the company from Devlin for $594 million in 1987. By sheer chance, he was looking to sell because Devlin’s kids complained they never saw him—and as luck would have it, that’s when Thorn was looking to buy. Rent-a-Center, as we know it today, was the product of merger-mania. The company with the name Rent-a-Center isn’t the same one that was founded in 1973. Instead, a company called Renters Choice, which took its current form in 1986, bought Rent-a-Center in 1998, and because the chain had a better-known name, the company changed its name. 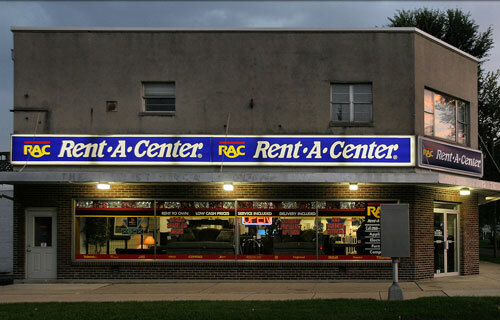 Even before taking its current form, Rent-a-Center had a reputation. A 1998 Bloomberg News report notes that at the time of Rent-a-Center’s sale to Renters Choice, the company was facing multiple class-action suits over its incredibly high interest rates—leading to Thorn’s decision to unload. Its current CEO has been associated with the company since 1979. While he didn’t stick around the whole time, Mark Speese, who was reappointed CEO earlier this year, started with the company in 1979 as an account manager, then left in 1986 to start his own company, Vista Rent-To-Own, according to SEC records. That firm was eventually renamed Renters Choice. In other words, Speese ended up back at Rent-a-Center via acquisition. — Sonia Holland, Rent-A-Center’s director of communications, responding to claims of threats and intimidation filed with the Federal Trade Commission. Holland was specifically responding to inquiries by Matt Novak of Gizmodo, who last year dug up the FTC complaints, which include claims of of arrest threats over voicemail, aggressive house calls, and even a false call to the police. To put it simply, rent-to-own stores don’t have a good rep these days. Hearing the horror stories about Rent-a-Center—and there will be more in this text, unfortunately—you wonder if something got lost in translation between the British market and the American one. Why did a model like Radio Rentals become so widely accepted by such a large swath of its country’s population, while Rent-a-Center carries such a stigma nowadays? I think, if I had to nail it down to one thing, the factor that changed the dynamic of the rental model was credit. There wasn’t much of it in 1930s Great Britain, and it took a while for credit to become a serious consumer force—which it did well after the start of the television era. Credit cards, of course, took a long time to reach their mainstream potential, and perhaps didn’t do so until the 1980s. And those who received credit had more buying power and could purchase something like a dining room set or a TV without having the cash on hand. The 1980s, of course, were when rent-to-own places were starting to blossom. So how did they handle this dichotomy? Simple—these companies started to focus on those without credit, or those with bad credit. They need dining room sets, too. And because Rent-a-Center or one of its competitors is taking all the risk, that means they can set the price wherever they want. The model, of course, is very similar to the payday loan model, but it also involves a television set, or maybe a laptop, rather than literal cash. Some context regarding what that means: Here’s a TV at Aaron’s, one of Rent-a-Center’s biggest competitors. It’s on sale for $82.99 per month, plus tax. It’s yours in 24 months, at a total cost of ownership of $1,991.76. Here’s the same TV, with the same SKU number, at Best Buy. It’s also on sale, for $799, down from its normal price of $1,099.99. Even taking the sale price out of it, as a consumer, you’re paying Aaron’s more than $800 extra for the right to let you pay in 24 months. It should be noted that Aaron’s has a better reputation with the Better Business Bureau than Rent-a-Center does—though even Aaron’s has seen some controversy around its business practices. But this is an easy model to punch down with, and a lot of consumers struggle under its weight. In recent weeks, the activity around Rent-a-Center has been something worth keeping an eye on. The company has seen a lot of leadership shake-ups, and has tried (and thus far failed) to sell itself. Perhaps the hardest knock on it, however, is a multi-part series on the company done by NerdWallet. The series, done in collaboration with the broadcaster Raycom Media, not only highlights the high cost of rent-to-own, but the overly aggressive tactics taken when payments are late and the company’s often-obtuse billing practices. “A missed payment, even one late by as little as a day, can trigger an aggressive response by employees or touch off record-keeping errors at the company, former employees told reporters,” the report states. Often, the company would report someone’s debt to collectors even if it was fully paid off. Even debt collectors were shocked by the company’s practices. Recently, you may have heard that the Consumer Financial Protection Bureau has faced some leadership shakeups over who controls the organization. After some initial confusion, it appears Mick Mulvaney, the head of the Office of Management and Budget and a noted critic of the bureau, will be in charge. Mulvaney comes at a weird time for oversight of Rent-a-Center. NerdWallet notes that back in July, the bureau tried taking a stab at regulating it, something its CEO once claimed wouldn’t be possible. It remains to be seen whether it will continue to be reined in under the new leader. But even if it isn’t, a quick word of advice: Friends don’t let friends go to Rent-a-Center.